In an effort to curb the sheer amount of waste I see around me, I have been on a rampage of using things up: in the kitchen, in the bathroom, at work, (inappropriately) in other people’s lives. This rampage has also been driven by a level of upsettedness at how much I seem to have accumulated in my life that drags me down. I can barely stomach looking in my wardrobe it’s so packed with crap that I can’t deal with. I wrote a bit about the joy of empties in the past. I’m feeling very smug because I’ve keep the process up, and can share with you the little stash of empties I’ve amassed since I began my focussed attempts at using what I have in lieu of accumulating more. You may recall me banging on about this little tube of wonder in my skin overhaul series. This little guy goes for about $33 at Priceline and does wonders for rejuvenating your skin’s hydration levels and plumping out the fine lines that pop up when you aren’t giving your skin some tender loving. This tube lasted me about 2.5 months of twice-daily use. I also accidentally used way too much in the early days, so I’m confident of it’s longevity. It has already been pre-purchased and is a non-negotiable element of my morning skincare regime. Although pricier than your standard wiping alcohol makeup remover you can grab off the shelf at Woollies, this melting balm both thoroughly removes your makeup and acts as a healing and cleansing balm on your poor face which has spent the day dealing with the world. This tub lasted me around 3 months. I love that I don’t need to use those little makeup pad wipes to remove my makeup and I love how this product helps me double cleanse in the evenings. This little sample was gifted to me by my Wedding Skincare Consultant. It is AMAZING. The product goes on so smoothly and is cooling and hydrating and made my skin feel ready for the day. I’m waiting for the magical money fairy to fly by and let me buy this in full size one day; until then I’m ruthlessly working through some cupboard-hidden moisturisers. Purchased in a moment of panic at Priceline when I walked in and felt like I had to buy something. Perfectly fine but leaves my hair a little flat. Will not repurchase save for Priceline brain-fart situations. These mini purchases breed in my handbags and desk drawers. As with everything else, I’m methodically working my way through them. One down. One thousand to go. Aesop gifted me three face mask samples that are promised to reduce acne. I used one last week, and I could feel the impact quite quickly. One down, two to go. 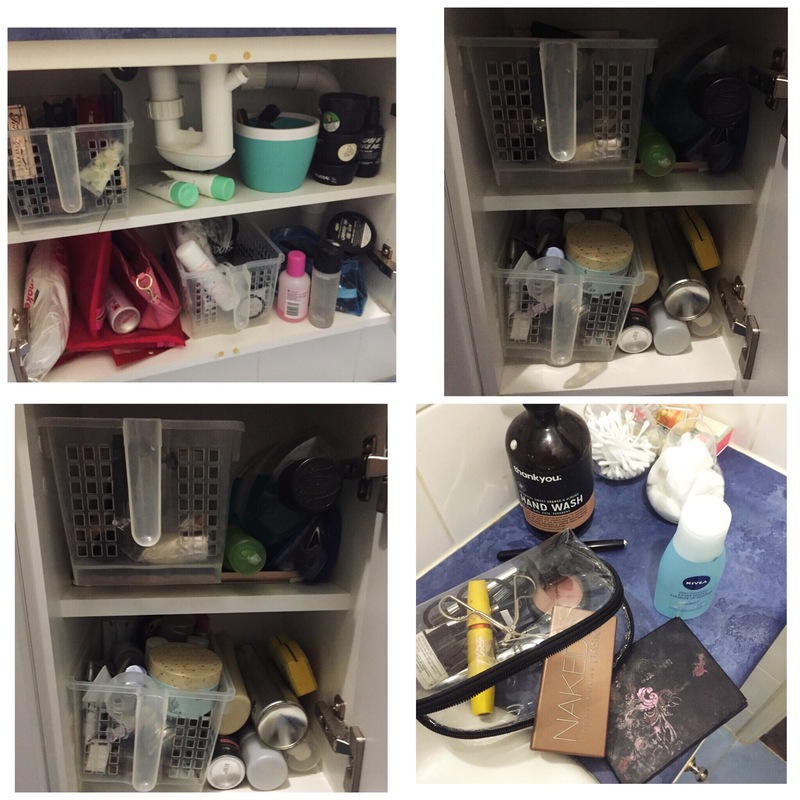 Since my KonMari bathroom purge in 2016, where I discovered I had over 20 liquid foundations of different shapes, sizes and tones hiding in my cupboards, I have been committed to only having one liquid foundation that I studiously use up before purchasing a new one. I’m very happy to say this one is complete. I had already restocked in the form of a Maybelline foundation in the Priceline 40% off cosmetics sale, and am now working my way through this newly preferred brand. I’m also proud to say I’m getting dangerously close to using up a powder foundation that I’ve had in the cupboard since my university graduation in March 2014. I can see glimmers of the pan, and am dying for the day it is done and used, and I can commit to thoughtful contributions to my makeup collection. In addition to these itemised lists, I’ve also blasted through an entire cake of honey soap that is made in Australia (it was just beautiful), and am now smashing through a bottle of bodywash I received in a subscription box. In other facets of life, I also listed 31 items of clothes on eBay, sold 9, relisted 14 and donated 8. The most shameful thing about this eBay extravaganza is how disgustingly full my cupboard still is, and how not-lighter I feel despite this purge. These are always excellent times for some self-reflection on why you bought the stuff in the first place, and why it no longer brings you joy, then working out how to continue with refining your tastes, your spending, and yourself. I’m going to be doing another cull this coming weekend, which will both give me a cash diet appropriate activity, as well as hopefully increasing the amount of cash I have to spend in this month of poverty. Generally I’ve felt super inspired after heading down the no-waste internet search spiral and am now constantly looking for ways to incorporate the principles of using what you have. It is a very slow process, but also deeply rewarding. A year later and I am on board the KonMari train to tidying and magically transforming my life into a world of unicorns and rainbows dancing around all the newly freed up space in my home! I got back to the land down under on Saturday and, after watching all the crap spill out of our suitcases, adding to the stuff already filling up our little home, I was itching to get discarding. 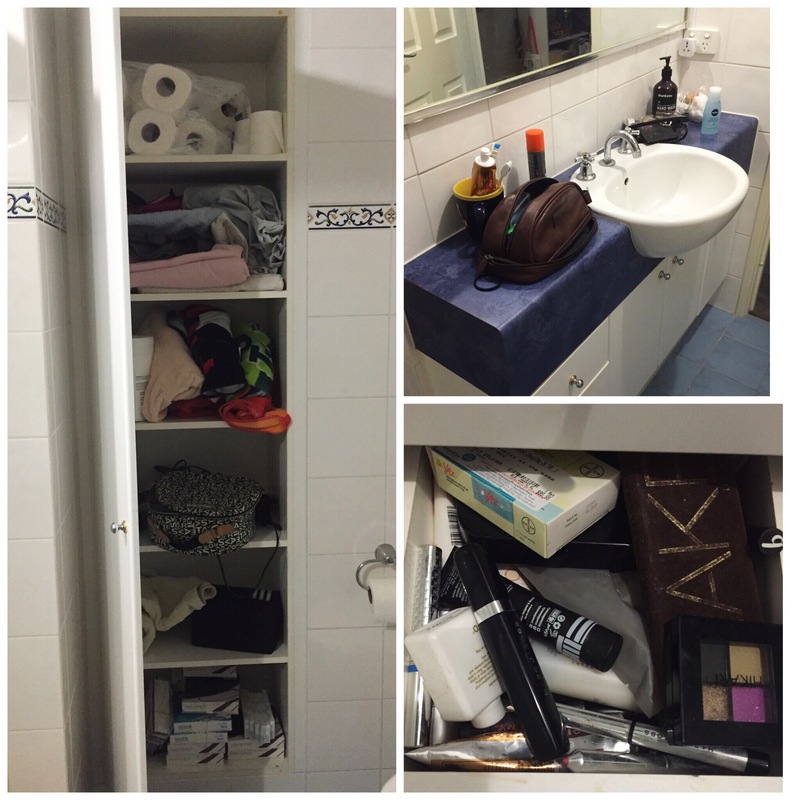 I defied the KonMari laws and started with the bathroom, because I embarrassingly harbour very strong emotional connections to my clothes (I know, I’m insane), and wasn’t ready for that horrible process of saying goodbye. With jet lag waking me at the delightful hour of 4.50am, I got up, got to work, and “discarded” (aka got rid of a tonne of sh*t). Below is a step-by-step guide to my first foray into performing magic upon my bathroom. Room deets: combo bathroom/laundry. Contains 3 drawers, three cupboards under the sink, and one long cupboard with 6 shelves. Laundry sink is also full of random items. 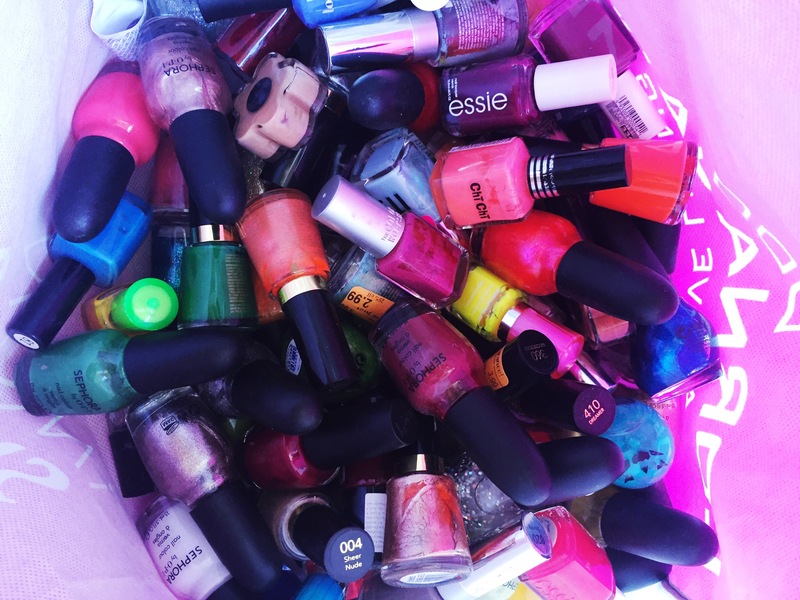 There is an additional box hiding in the bedroom containing nail polishes. Every item got lovingly held, interrogated about its ability to bring me joy, and put either into the bin (see ya exploded lip gloss I never dealt with), the throwing away box or the keep box. This was quick, as a lot of the stuff was embarrassing (shimmery Ed Hardy body lotion? Seriously, why). I sat down with a clear coffee table, notebook and pen, and wrote down every item and tracked whether it went in the discard purgatory or the bring-me-joy-baby keep pile. (This step was motivated by Cait Flanders, and an intention to start a shopping ban). The adventures of my rank bathroom cupboards required a massive wipe down of every single item and all containers. Apparently my foundations like to randomly squirt out of the bottles and cause havoc when I’m at work. Surprisingly, that process served as a second-round cull, as it did not bring me a single speck of joy to look after some of that stuff and I never wanted to wipe down hundreds of items again. Step 5: Order boyfriend to take out rubbish to avoiding risking the “temptation” of hanging on to any of the non-joy-giving-devil-items. I really wanted to go to IKEA to buy the perfect storage, but I held strong to the Oracle (all praise Marie Kondo) and used what I had around the home, since the solution isn’t buying more storage, but having less stuff. I even put my iPhone 6 box to work, since the book had specifically recommended apple product boxes. I took this extremely seriously. This takes frickin forever. I got grumpy and had a nap. Step 8: Resume finding shoe boxes in which to neatly stack your stuff after refreshing nap. Discarding items is awesome and eye-opening. I had SO MUCH MORE junk that I even fathomed – see you later high horse of “I live in a small apartment and hardly have anything”. Tracking your items is tedious but very rewarding. I made up a spreadsheet afterwards so that I can continue to track what comes in and out of my life, and share the total stats below. Don’t ever subscribe to makeup subscription boxes. They increase your Total Crap Percentage (or TCP) by a factor of a zillion, and it’s extremely unlikely you’ll use any of it. 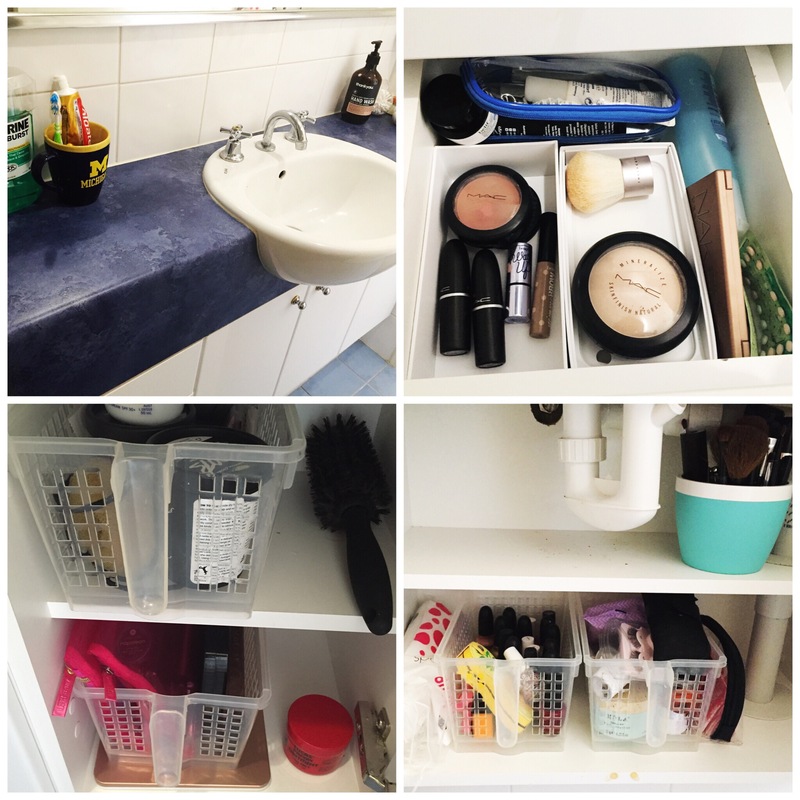 Clean or wipe down everything before putting it back – this step really made me appreciate what I had and inspired me to want to look after what I have better so I don’t have an urge for shiny new stuff all the time. Shoeboxes as storage is awesomeeee. Marie Kondo knows her stuff. While I didn’t thank all my items out loud for taking care of me at my worst and loving me at my best and whatever, I did generate a very deep appreciation for what I have, and mentally engaged in some serious gratitude (alongside a little self-berating of why-did-you-ever-even-think-it-was-a-good-idea-to buy-this-you-idiot questioning and avoiding mentally calculating the money I wasted). See you for round 2 – Clothes, otherwise known as the Era of Activewear Confrontation. While sitting in the Trinidad airport (as is my wont these days… But only until Saturday! ), I stumbled across some articles in Google, and found out that even IKEA thinks we’ve reached peak consumption? Well, if the company that, to me, is the true definition of consumerism, has openly admitted we’ve just got too much stuff, then I suppose this de-clutter/simplify/minimalism movement really has some weight behind it. Homewares hasn’t really been a huge issue for me. We moved into a shoebox apartment, and were given most of our furniture courtesy of generous family and forward-thinking parents. That combination of lack of space and already having everything meant that there was no need to go shopping for all those delightful items to fill our home, since our home was very rapidly filled. Still, I am sure with the gradual inheritance of more space as we potentially move in the future (we’re committed to our cosy one bedroom for another year at this stage), will come the desire for more to “fill it up”. I’ll have to keep this concept of Ikea’s in mind – that we, as the human race, have peaked. It’s time to chill out on the buying and perfecting. I’ll be re-reading the KonMari book on my final (14 hour) flight home, and look forward to sharing the progress I make on our home (which is relatively low on homewares but still, likely to contain far more than I realise!). So as I mentioned, I read The Lifechanging Magic of Tidying up, and I’ve really got the itch to give the method a go. But in true first world problem style, I am on a month-long vacation and can’t possibly de-clutter (although my boyfriend would disagree, since I am known to be a chronic over-packer, but on the other hand, he’s now acquired two tennis racquets to bring home to Australia. Things are equal). But the itch still needed scratching and I decided to apply the “does it bring you joy?” test to my Instagram account at 3 in the morning, when another bout of insomnia had me staring at the ceiling. I’m a passionate consumer of social media, and, tragically, reality television shows (amongst other things such as cute clothes). I follow a lot of irrelevant people and stores who I don’t know on Instagram, and from the book, realised that bloated number of followed accounts and feed full of crap was most definitely not bringing me joy. I had done a similar cull in November, after I spend $180 on clothes from an online store who only advertised on Instagram. I was pretty mortified at myself, and immediately went about an extreme cull of brands that caused me to feel inferior and as though I needed to purchase more and better to be happy. But letting go in this way can be such a process. Last night I culled every Bachelor and Bachelorette Australia account (it seems like the former “contestants” just go on to a career of mediocrity, unsubtlely advertising miscellaneous irrelevant brands on their Instagram after the show ends), all brands, every celebrity (save for Kayla Itsines, whose #fitspo life I truly can’t get enough of and, pardon my wilful state of gullible-ness, seems not to advertise anything but her own workout app regime anyway) and any other person who I actually didn’t feel “joy” at seeing their account. Across the total last two culls, my estimate is I unfollowed 80 accounts which I deemed as not bringing me joy. This was a timely reminder to me to try keep track of some numbers, although I suppose it doesn’t really matter. I undoubtedly feel lighter, calmer and happier when I scroll through my Instagram account (which I do far too often, but that’s another issue). I’m definitely looking forward to applying the method to my apartment when I get home. The first book I read of 2016 has been the book that has been talked about non-stop for the last year – Marie Kondo’s ‘The Life-Changing Magic of Tidying Up’. First I should say, I’m on vacation. This is probably book better read on a quiet weekend at home. While I enjoyed it, naturally you want to implement straight away – which just isn’t going to happen while vacationing. Second, I was pre-prepared for the nature of the book from the ten billion reviews of this quirky guide online. I knew it talked about odd things like thanking your socks. That’s fine. Third, I’m an impatient reader. With these things in mind, my response to the book was that it was fine, but there was far too much filler to allow it to be good. The ‘KonMari’ concepts are great. I love ditch (or declutter) first, store second. I love the simplicity of the questions you ask of yourself in the throes of decluttering. But I got bored reading them on repeat through a lot of mindless other observances. These detracted from the message: create a home containing only those things that will spark joy, and your life will more easily fall into place. The practical tips were great. I liked the folding method. I loved the specific examples of whacky items that irrefutably satisfied the ‘does it spark joy?’ test, despite being inexplicable to an outside observer. However, there was so much repetitive crap around the outside to wade through that I found it hard to engage with the core message. That’s been better clarified by reading the one trillion articles that more clearly define the message. My general position is to just read those articles. But perhaps you miss the full experience of the KonMari method if you don’t take the two hours to just engulf the book. In the end, the repetition and some of the weirder aspects such as thanking your bag each day when you unpack it don’t hurt anyone, and it’s up to you to find your personal spin on KonMari. There’s no dictation. I definitely intend on implementing a few aspects into my life once I return home.